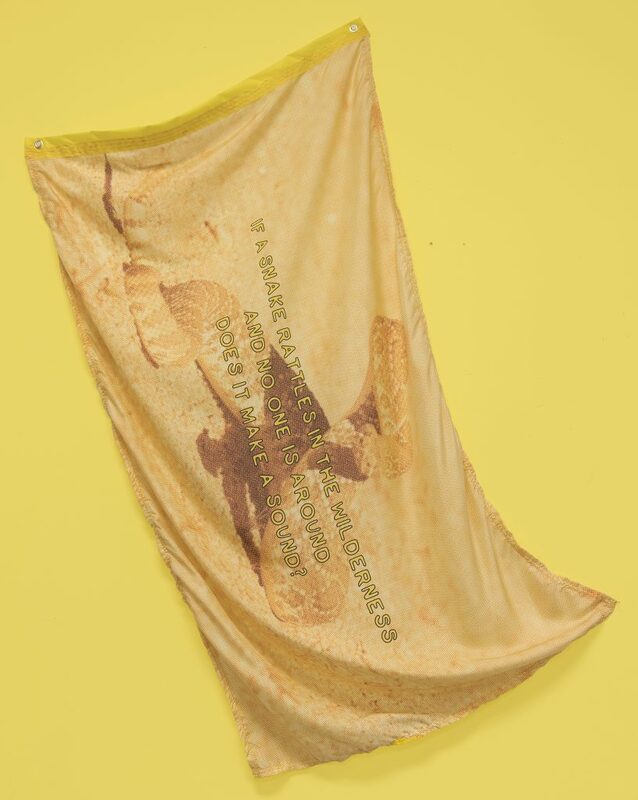 Dont tread, Dont tread, Dont tread examines the changing meaning of the Gadsden flag, an early revolutionary US flag, by creating alternative versions of the flag that mimic and remix its original design. The work points to the flag’s shifting symbolism, and its ongoing misuse and misinterpretation. Initially as a joke, Ben Franklin wrote in 1751 that Americans should consider sending rattlesnakes to England to thank the British for sending convicts to the colonies—a policy the British had enacted. The rattlesnake quickly became an iconic symbol for America that represented liberty and revolution. It was adopted by the Continental Congress and the motif was used extensively by the US Army, eventually becoming an emblem on standardized flags. As recently as the 1970’s, the flag was adopted by libertarian groups, and later by the Tea Party movement. It has most recently shifted from being a non-racial symbol of independence, to being adopted by nationalist groups as a symbol of racism, anti-immigration, and government overreach. Given its satirical start, can symbols such as these be re-imagined to take on new identities? In this political moment, Dont tread, Dont tread, Dont tread prompts new meanings and potentials, and consideration of their social and political implications. Katie Hargrave (b. 1985 Chicago, resides Chattanooga, TN) is an artist interested in tinkering, manipulating, and remixing material from American History to create a more ethical and inclusive understanding of our political and environmental landscape. She received her MFA in Intermedia from the University of Iowa, an MA from Brandeis University, and a BFA from the University of Illinois. Her work has been shown nationally and internationally at university galleries, non-profits, and festivals. She is a member of the collaborative groups The Think Tank that has yet to be named‚ and Like Riding a Bicycle.